Recently, I came across a book called “The Man Who Quit Money.” Now, this is not the genre of book that I usually read, as I prefer historical romances or the latest chick lit to tales of grizzled old men living in caves and eating live lizards. However, this book by Mark Sundeen has been a truly enlightening experience. Reading about a person who eschews the giving and receiving of money has made me reexamine what I spend my hard earned dollars on. And the biggest money pit I tend to fall into? Beauty products. Now the man in the book may be ashamed to read of this connection I am drawing, but I think he would be proud of some of the creative ways one can cut back on spending while at the same time using products already in the kitchen to create something useful. Below are three recipes I have actually used that work just as well (or better) than many items offered up by Sephora or even the local drug store. Many people don’t know that plain old aspirin contains salicylic acid, the same ingredient used in many name brand facial products used to treat acne. This aspirin facial scrub is the simplest thing you will ever make. Simply take about five uncoated aspirin tablets, add a few tablespoons of water, and then crush the aspirin with a fork. Stir, and then use the paste to scrub your face. Rinse, and find your skin superbly smooth! Strawberries contain malic acid, which is a gentle bleaching agent. Mix a few mashed up strawberries with a few sprinkles of baking soda and brush your teeth with it. The snazzy toothpaste is known to whiten teeth and remove stains from coffee and red wine. Fab! 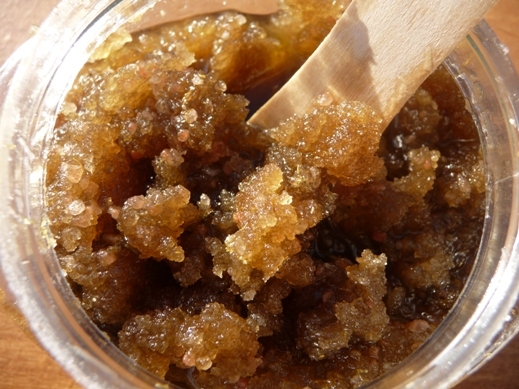 This scrub smells so scrumptious, you’ll want to eat it. All you need is half a cup of brown sugar, ¼ cup almond oil and one teaspoon vanilla extract. Mix all ingredients in a bowl and voila! You have yourself a very effective body scrub for the mere pennies of a few simple kitchen ingredients. So there you have it, you don’t have to dumpster dive or forage for wild onions to save money, just ask yourself if you truly need that $40 jar of body scrub, or if making it at home for yourself may this time be the way forward. The man who quit money would be so proud.